Info "Swish the tube until the color changes. Don’t spill any or you’ll have to use the safety shower!" Flask Me Later is one of Ashley's Microgames in WarioWare: Smooth Moves. The name is a pun on the phrase "ask me later". 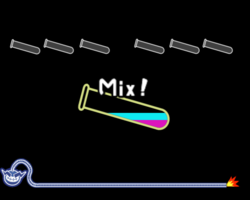 The player has to shake the flask side to side until the color changes. Caution must be practiced to prevent the solution from spilling out the flask. 1st level difficulty: The player will shake a test tube. 2nd level difficulty: The player will shake a small bottle. 3rd level difficulty: The player will shake a large bottle. This page was last edited on February 19, 2018, at 23:11.